•et; Power up\/Power Down, with Manual Release. •et; Heavy duty dual direction motor in 12V and 24V DC. 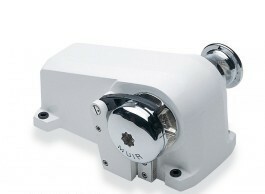 •et; Durable marine grade white gloss finish alloy housing. •et; Fully enclosed motor and gearbox. •et; Luxury chromed marine grade bronze running gear. •et; Stainless steel drive shaft. •et; Amps Work Load: 80. •et; Max Line Speed: 25m\/min. •et; Chain Size (MM): 6, 8. •et; Rope Size (MM): 12, 14. •et; Net Weight: DC 12kg.